Repair Outlook PST Software can be used for recovering PST files with minor or severe levels of corruption. Effectively repair Outlook PST to retrieve Hard/Soft deleted emails. Repair password protected MS Outlook PST files without any difficulty. The PST files of MS Outlook save various types of user mailbox data such as emails, messages, contacts, calendar, tasks etc. Microsoft Outlook PST files are represented by the extension .pst and are available only locally on the computer on which MS Outlook is installed. A large percentage of email users are heavily dependent on MS Outlook for their various needs. Sometimes PST files may get corrupted due to a variety of reasons and in order to continue the service there arises a need to repair Outlook PST file. In such cases, the only way to remove PST file error issues is to hire a software like the Repair PST tool that helps to provide access to .pst file data by allowing you to proficiently repair Outlook PST and export it multiple file formats. The Repair PST tool is embedded with the latest scanning algorithms that deeply scan each data item to repair Outlook PST file. When scanning is completed it provides options to preview & save all mailbox items like Emails, Contacts, Calendars, Journals and Tasks in multiple file formats like PST, EML and MSG. During the repair process, the tool gives the option of saving the (.pst) file data(emails, calendar, tasks) into several file formats such as PST, EML, or MSG. Thus the data becomes compatible with other email clients such asThunderbird, Outlook Express & several others. It is difficult to handle a large sized file so the tool can divide the .pst file into small parts so that it can be easily managed. The size of the recovered files can be adjusted by the user during the repair process. Repair PST tool is capable of filtering messages by date order. After defining a particular time period, the emails within that time can be obtained. This greatly saves time as you don't have to wait for the all the emails to be recovered till the Repair Outlook PST software ends execution. After software concludes successful repair corrupt Outlook PST files, the tree structure in the new file is the same as that of the original file. As the user is familiar with the order in which data is stored, it becomes very easy to find the desired data. The Outlook recovery software does not make any changes to the formatting of the different data items when it starts to repair Outlook PST. It also maintains the metadata for all the contents of the file. A CSV report is produced when the repair of broken PST file is completed by Repair Outlook PST software. This report consists of information about the various contents of the file in the form of a spreadsheet. This helps in summarising the activities performed. The Repair PST tool gives solutions for both minor as well as major cases of .pst corruption. For the repair of files which are damaged to a small extent, the Normal mode can be used. Other cases where corruption is severe can be handled by Advanced mode. The software possesses the capability to process and repair corrupt PST file in bulk. This functionality is provided by the help of Batch Mode which gives the option of Search All and Selected Drive. xxxx.pst cannot be accessed - error code 0x80040116. The Repair PST software is also available as a trial utility to effectively repair Outlook PST files that have been damaged or corrupted. The trial version of the Tool can easily manage large number of files and retrieve data and finally export it to various different types of email client formats such as MSG, PST, EML and Office 365. The trial version provides limited functionality and repairs only 25 items per folder of PST file. To avail full features it is recommended to go for the Licensed version which is available at an afforable price. I have a PST file whose contacts have been deleted permanently and I want to recover them. Can I get back my deleted contacts from a PST file? 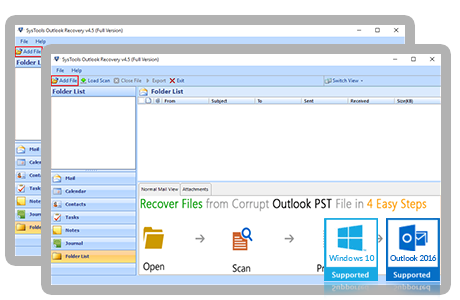 Yes, the Repair Outlook PST Tool can recover deleted contacts as well as emails, calendars, tasks, notes from PST files. Do I require Outlook to be installed before I start to repair corrupt Outlook PST file? No, the Repair PST Tool does not need you to have Outlook preconfigured and installed before starting off with the Repair PST process. I am using older versions of Outlook and I have an ANSI PST to be repaired. Can the software help in repairing ANSI type PST? Yes, the software supports ANSI PST and also it can easily repair Outlook PST of both ANSI and UNICODE type files. Whenever I'm trying to access my PST files, I'm getting the message The file xyz.pst is not a personal folders file. What should I do to get rid of this? You're getting this message because your PST file has been corrupted. To remove the damage done to the files and to repair Outlook PST make use of the specialized Repair PST Tool. Will my original PST file attachments and formatting get lost after the repair process? No, the Attachments and formatting of your original, damaged file will be preserved in the new file after the tool finishes its process to repair Outlook PST files. I was looking for a method to repair my damaged PST file to retrieve my contacts and important mail messages. The Repair PST tool proved to be of great relief as it helped me get back all of my data from my damaged Outlook mailbox without any issues. I can now work freely without worrying about losing my data due to the corruption of files. The Repair Outlook PST Software not only assisted me in getting back my data but also enabled me to take a decision about which emails to recover through its smart date filters. I haven't yet encountered a simpler and quicker way to repair damaged PST files. At first I was under the false impression that my files could not be repaired as they were heavily damaged. But the Repair Outlook PST utility proved me wrong as it helped me repair Outlook PST file data through its Advanced scan mode. I'm very satisfied as this software has resolved all my problems.